In this retelling of Cinderella, Ella does not, in fact, need rescuing. Her fairy godmother put a spell on her without her permission. Now she has to go to ball after ball until a prince sweeps her off her feet. What an unfortunate situation. Luckily, Harriet and Wilbur are here to help. Harriet is especially ready to help, because she herself understands that balls can be exhausting. Not that Ella is complaining exactly, but she sure would like to be seen as she is without magic involved. I was very excited to read this book. 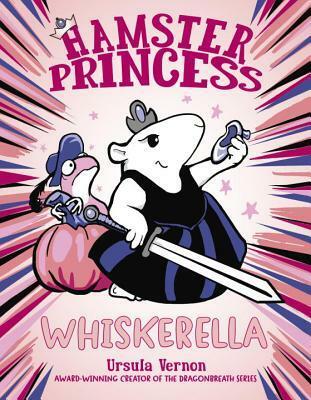 Harriet is hilarious when she has to save damsels in distress, since she hates the concept and likes to empower girls. I say ‘‘hilarious’’ because when something bothers her she becomes fierce and makes really unexpected comments that are quite entertaining. I hope this is not the last we’ll be seeing of Harriet and Wilbur, though I don’t believe it is. There are so many fairytale left to be retold—I for one can’t wait for the author to play with Beauty and the Beast as well as The Princess and the Frog. My fingers are crossed.